For my U.S. readers, Happy 4th of July! I hope you are enjoying this odd mid-week holiday off from work if you have it. 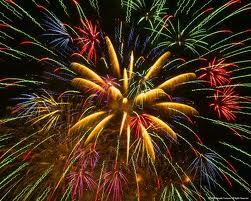 For my readers overseas, today is the day each year the U.S. celebrates its independence from Great Britain. Yes, for 200-plus years, we’ve had a party to celebrate our independence with picnics, parades, and fireworks. Now that I write it down it seems a little silly, but it’s nice way to have a day off from work in the middle of the summer! So I’ve been thinking for a week what I could create with that would be a red, white, and blue dish. I decided to let my own creative juices flow, no cookbook or Internet searches for this one, I wanted to do it on my own. And it was a difficult assignment! Of course, you can’t go wrong with fresh strawberries and blueberries with homemade whipped cream. But I wanted something with a little bit more depth and something that wasn’t a dessert. So I created my own Red, White, and Blue Salad to celebrate the Fourth! A few nights ago, when it was a bit cooler, I noticed some sad-looking red peppers in the vegetable bin. Never one to waste an expensive vegetable, I sliced them up, placed them in a pan with a little bit of olive oil, and roasted them until they were soft and brown. Step one, check. The red was done! Of course, you don’t have to roast your own peppers, you can substitute tomatoes or store-bought roasted red peppers. The white was easy, you can either use white button mushrooms or in my case, white Hakurei turnips. 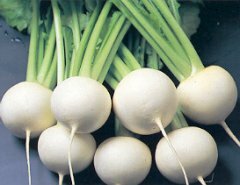 In early summer, I find these small white sweet turnips at the farmer’s market and coop that you can use in salads and stirfries. They are beautiful, perfectly shaped little white globes. And these are an all in one vegetable, as you can also cook the greens. They’re a great addition to kale or chard sautéed with garlic and olive oil. With some crumbled blue cheese in the fridge, I was able to easily assemble these salads in just a few minutes. For a salad dressing, I made my usual vinaigrette but with a few twists; instead of garlic I used a little bit of chopped shallot, and added a few chopped capers. I thought the flavor of both would really make everything zing and I was right! If you want to make this a salad supper night, adding a little bit of chicken, tuna, or beans would be a welcome addition. Just be sure to save room for the berries and whipped cream for dessert! 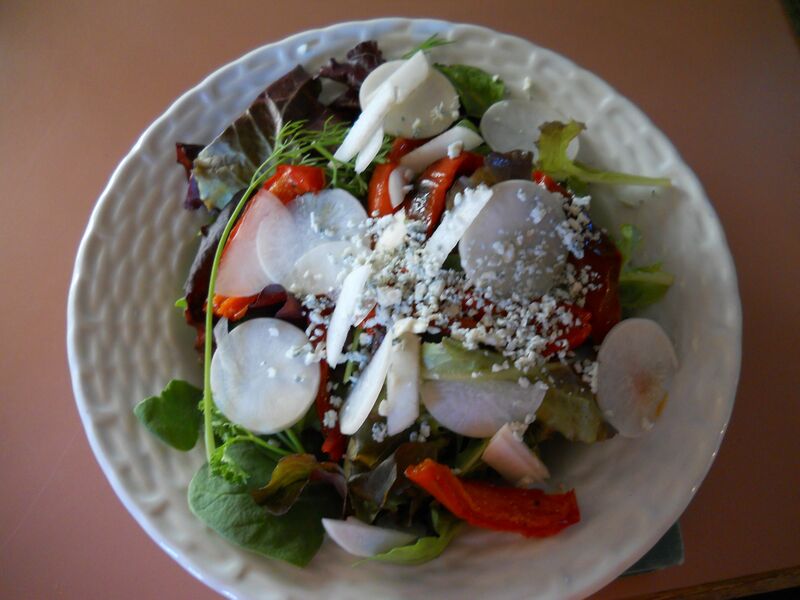 With a salad plate, place a handful or two of lettuce mix. Arrange the roasted red peppers and turnips on the plate. Add a teaspoon or two of the vinaigrette and add a little bit of the blue cheese. Add ingredients to a small mixing bowl, whisk, and serve atop the salad. Yum. I love Hakurei turnips. A good idea I’ll have to try. Happy Fourth to you, too. I’m going to send you a recipe that a restaurant in Oxford, MS had. One of the other Booktopians liked the salad so much, she asked for the recipe. The presentation makes this one!